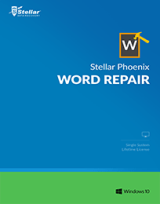 Stellar Phoenix Word Repair software helps you in repairing corrupt or damaged MS Word files. This software thoroughly scans all the selected ‘Word’ documents and uses an advanced algorithm to restore ‘Word’ files back to their original state. Repaired files can either be saved at their original location or at preferred location. Supports MS Word 2013, 2010, 2007, 2003 and 2002.